Degenerative myelopathy in golden retrievers is the human equivalent of Lou Gehrig's disease in people. While degenerative myelopathy is most commonly found in German shepherds, golden retrievers can also carry the gene responsible for this dreaded disease. This muscle-wasting ailment resembles amyotrophic lateral sclerosis in humans, a condition known as Lou Gehrig's disease. Genetic testing beforehand helps you avoid the heartache of this fatal condition. 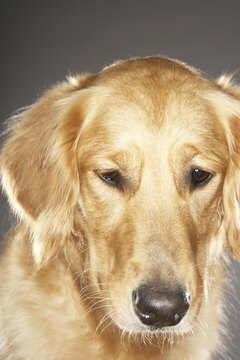 Degenerative myelopathy affects a golden retriever's spinal cord by degenerating the nerve fiber's insulation, the myelin. This results in the nerves no longer signaling movement to muscles. According to VeterinaryPartner.com, the disease is caused by a gene called superoxide dismutase 1, identified in 2009. Early signs of degenerative myelopathy include an odd gait or difficulty getting up from standing or sitting. Since degenerative myelopathy rarely strikes golden retrievers before the age of 8 or later, if you notice these issues in a young dog it's likely something else. As time passes, your golden starts dragging his hind feet, experiencing difficulty in holding his back end up. Because the disease is degenerative, it just gets worse. Diagnosis begins with a process of elimination, since the only definitive way to diagnose degenerative myelopathy is during a necropsy after the dog dies. Your vet will take blood samples, conduct a spinal tap, perform MRIs and similar tests to rule out other diseases. There is no cure for degenerative myelopathy, so affected dogs are eventually euthanized. That doesn't mean your vet can't treat your dog and give him a better quality of life, often for a prolonged period. According to Georgia Veterinary Rehabilitation, Fitness and Pain Management, intensive physical therapy can prolong a dog's life by up to three years, as compared to six months for affected dogs not receiving therapy. If your golden retriever develops degenerative myelopathy late in life, as most do, he might live the equivalent of a normal 12- to 14-year life span with therapy. In addition to physical therapy, slings can help you lift your golden retriever, while a wheelchair for his rear legs can give him added mobility. As the disease progresses, your golden retriever might lose control of his bowels and bladder. As his quality of life declines, that could be the point at which you want to consider euthanasia. It's possible to test your dog for the gene causing degenerative myelopathy, or ask a breeder to do so before your purchase a golden retriever puppy. It simply involves swabbing the inside of the dog's mouth, then sending the sample to the testing agency. The results show whether the dog is normal, or at low risk for ever suffering from degenerative myelopathy; a carrier, meaning he won't pass come down with the disease itself but could pass it to offspring, or at risk, meaning he might eventually come down with degenerative myelopathy. If your dog is a carrier, have the animal spayed or neutered. Does a Heart Murmur in Cats Require Surgery?